Maafe, or West African Peanut Soup, is traditionally made with beef, sweet potatoes and carrots. We put a twist on it to make this vegan, hearty and 100% full of flavor. 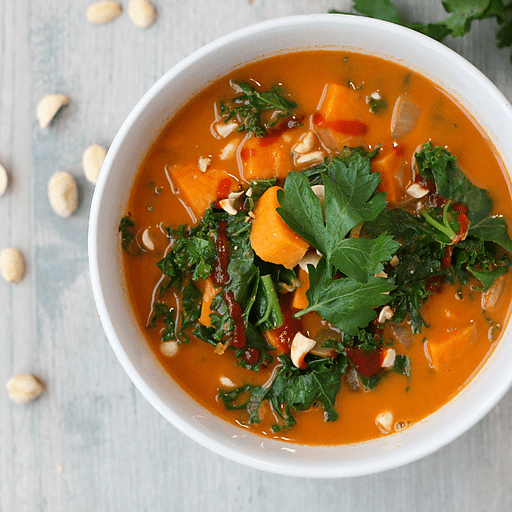 Don’t be scared off by the peanut butter in this soup - its creaminess blends perfectly with the spices to create a dish that will truly warm you up. While this soup is filling on its own, feel free to round it out by serving it with brown rice or a hearty whole grain bread. 1. Heat oil in a medium pot over medium heat. Add ginger and garlic and saute until garlic is soft and fragrant, 1-2 minutes. 1. Add onions and cook for an additional 2-3 minutes. Add sweet potatoes and cook until onions are soft and translucent. Season with cumin and red pepper flakes. 1. In a medium bowl, whisk together tomato paste and peanut butter. Slowly add in 1 cup of vegetable broth and whisk until well combined. Pour peanut mixture into pot and mix well. Add remaining broth and stir to combine. 1. Cover the pot and bring stew to a boil over high heat. Remove the lid, reduce heat to low and let simmer for 15 minutes, or until sweet potatoes are tender. Stir in kale and cook until wilted. 1. Serve hot and garnish with sriracha, peanuts and cilantro, if desired. Per Serving: Calories 280, Total Fat 13g (Saturated 2.5g, Trans 0g), Cholesterol 0mg, Sodium 400mg,Total Carbohydrate 32g (Dietary Fiber 5g, Sugars 13g, Includes 0g Added Sugars), Protein 10g, Vitamin D 0%, Calcium 8%, Iron 15%, Potassium 15% *Nutritional values are an approximation. Actual nutritional values may vary due to preparation techniques, variations related to suppliers, regional and seasonal differences, or rounding.